The Birdo & Yoshi Court is a tennis court that appears in the Nintendo 64 game Mario Tennis. Similar to Baby Mario & Yoshi Court, the court is based on Yoshi Story and the background of the court features different types of fruits as they appeared in Yoshi Story. 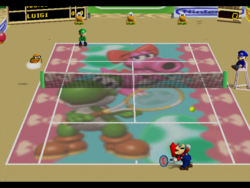 On the ground of the court, there is the picture of Yoshi and Birdo holding their rackets. It has a strong bounce with a slow ball speed. This benefits taller and speedy players. To unlock the court, the player has to win the Star Cup in doubles with Birdo. "Yoshi and Birdo share this court on Yoshi's Island." This page was last edited on January 16, 2018, at 12:57.